The concept of “quality of life” includes various dimensions of a person’s life and several instruments have been developed for its assessment and its correlation with the effectiveness of treatments and interventions in the patient’s life. Knee arthritis is a degenerative disease, which affects the patients’ quality of life due to its symptoms and its chronic nature. Several studies have shown that total knee arthroplasty contributes to the improvement of physical activity and of social life, it promotes psychological and emotional wellbeing, it improves mental clarity, liveliness, and eliminates or decreases pain. 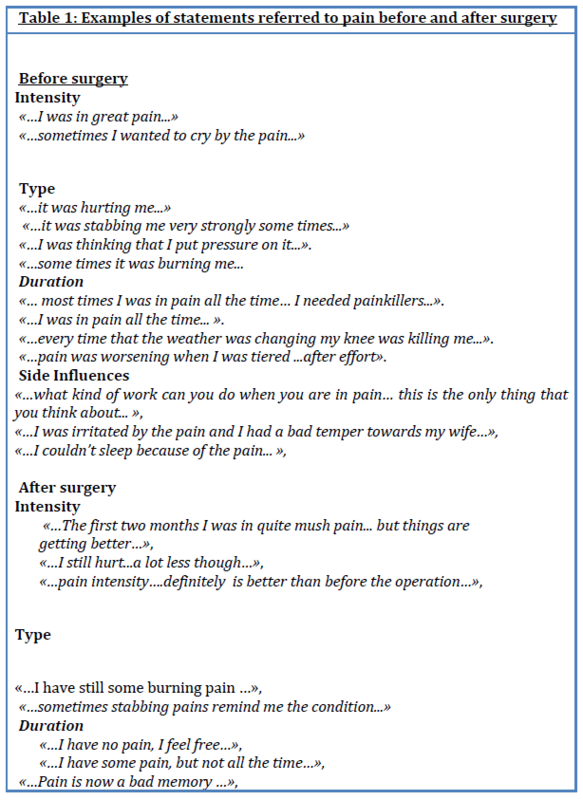 Aim: In order to investigate the patients’ perception on their quality of life before and after total knee arthroplasty, we conducted a qualitative study by interviewing patients by using an interview guide. Material and method: The sample consisted of 14 patients who underwent a surgical total knee replacement because of arthritis. The interviews took place in specific offices of the hospital and lasted from 45 to 60 minutes. The interviews were analysed with the method of content analysis. ResultsConclusions: It was found that pain, relative inability to respond to basic everyday selfcare activities, and difficulty in walking were the most important problems for whose who were not working. For those who were working, difficulty in walking was the most important problem since it inhibited almost every effort to work. The patients stated also that they were psychologically influenced by their condition, and some commented on the indirect social exclusion that they felt. Family was the main source of support for the patients in their every day life. The improvement of the patients’ functionality and of their overall quality of life after the surgical procedure was immediate and satisfactory. The concept of “quality of life” is a sophisticated one, including functional, physical, emotional and social dimensions of a person’s life, as well as social and spiritual wellbeing, human rights and environmental issues [1,2]. Due to this sophisticated nature of the concept there is often a difference between the way in which health care professionals and patients themselves understand the physical health and wellbeing of the patients [3‐7]. The last years the term “quality of life” (QOL) has become a common point of reference for international comparisons and several instruments have been developed for its assessment [8‐11]. Another term, the term “health related quality of life” (HRQL), is also used in the health care literature and is referred to the way in which a person or a group of people who suffer from some chronic disease understand their quality of life and concerns physical, emotional and social condition as well as their social wellbeing of the patients in relation to specific disease [12‐14]. 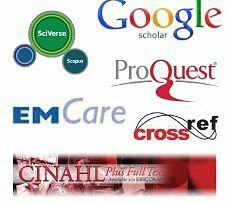 One of the reasons for the rapid development of quality of life measuring instruments is the recognition of the outcome of various treatments and of the effectiveness of several interventions in patients’ quality life [6‐8]. Health related quality of life is frequently measured in epidemiological studies that concern the assessment of a disease’s effects in patients’ and patients’ families lives, as well as for the assessment of the cost effectiveness of a treatment in comparison to other available treatments or to nontreatment [15,16]. Knee arthritis is a degenerative disease of a chronic nature, like any other arthritis. According to Tennant et al , twenty patients out of 1.000 people in the general population over 55 years old will benefit from knee arthroplasty, while 4 out of 1000 of those patients, even though they face major disability, they are not referred for surgical treatment. In the next 30 years it is expected that the demand for knee arthroplasty interventions  will increase by 40%. According to the literature, depression, stress, reduced livelihood, sleep disorders, reduced performance of everyday activities, disturbances of family role, decrease in sexual desire and activity, and the limitation of hobbies, consist some of the effects of arthritis [19‐22]. On the other hand, patients who are suffering from arthritis and are waiting for surgical replacement of their joint face a reduced mobility, restriction of everyday activities, sleep disorders, and more pain in relation to the general population . In a literature review of relevant studies by Ethgen et al. on thirty two studies focused on “health related quality of life” of patients that underwent hip or knee arthroplasty, it was concluded that this specific surgical procedure was effective in terms of improving the patients’ quality of life in the majority of the studies. Furthermore, McGuigan et al. reported that patients who underwent total knee or hip arthroplasty, two years after the operation stated that they noticed a significant improvement in their physical activity and social life, they have a better psychological and emotional wellbeing and a better mental clarity, they feel more vitalized and the pain has disappeared from their lives or at least has improved. Moreover, March et al. reached to the conclusion that total arthroplasty operations improved considerably the wellbeing and the quality of life of patients 12 months after the operation, while according to other studies the patients’ age did not seem to consist an obstacle for the operation and the expected outcomes [21,26]. According to Olivier et al. men seem to receive greater relief from pain after surgery in comparison to women, while patients who had worse quality of life before surgery stated greater improvement and satisfaction after the operation. Aim: The aim of this study was to investigate the patients’ perception about their quality of life before and after total knee arthroplasty. A qualitative study on a convenience sample of 14 people who had undergone total knee replacement due to arthritis, at least 6 months before the interview, it was conducted. Subjects were chosen through a 3‐phase process. In the first phase, the researchers approached two orthopedic surgeons of two hospitals; they informed them about the study and asked for his help in approaching the patients. Next, selected patients, who visited the outpatient clinics of the Orthopedic Department of the hospitals for a sixth month follow up after surgery, were informed about the study and were asked whether they were interested in participating in. Patients who expressed interest in participating received additional information, with special emphasis on data confidentiality, as well as on the right to cease their voluntary participation at any time, without any ramifications on their current or future treatment and they were asked for one more time if they wish to participate in the study. During this phase, 19 were patients agreed to participate in the study. Nevertheless, five of them did not finally accepted to be interviewed for personal reasons and appropriate times for conducting the interviews were set after agreement between the participants and the researchers. The Nursing Department of the Technological Educational Institute of Thessaloniki, acting as an Ethics Committee, approved the protocol of this study, and permission to carry out the study in the hospitals was given by their authorities. A semi‐structured interview guide, which it was validated regarding questions included and appropriate wording by three experienced researchers . The interview guide used helped in addressing the topic of the experience of the quality of life of knee arthritis patients before and after surgery. Information on demographic and social characteristics of participants was also collected, while a last question provided an opportunity for the subjects to share any additional information or feelings he/she might wish to. The interviews took place in an office in the outpatient clinics of the Hospital and they lasted from 45 to 60 minutes, according to the patients’ responses. All the interviews were recorded on audiotape, and no additional information was collected after the completion of the interviews. The patients did not receive any kind of compensation for their participation. A content analysis review was applied  and all the interviews were transcribed and the typed texts were checked in comparison to the tapes for accuracy. For the purpose of achieving a thorough understanding of the material, the transcribed interviews were repeatedly and carefully read by the researchers, following which each researcher independently classified the subjects’ responses into code categories as they emerged from the participants’ words. Next, researchers met to discuss the code categories, necessary adjustments were made and four main code categories (pain, self‐care, feelings, information and support) were agreed upon. The content of the main code categories was further categorized into subcategories meaningful to the studies, which were once again agreed upon by the researchers. The final code categories and subcategories defined and used for data analysis are illustrated in figure 1. 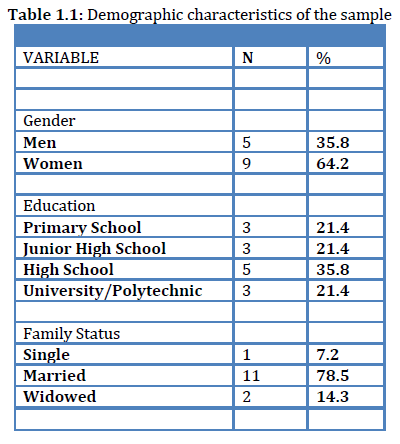 Demographic information was separately analysed with regard to sample size, participant’s age, marital status and level of education. • Support provided by family and other sources. Pain constituted the major problem for patients before the surgery, since it was the most difficult symptom for all the participants. Thirteen out of fourteen participants were in great pain while some of them they were attributing their pain to various external factors such as weather change, stress or tiredness. Regarding the characteristics of the pain subjects were referring to its intensity, its duration, and its type. Furthermore, subjects complained that pain had also side influences on their psychological wellbeing, their relationships with others, their daily life, their work and their sleep. Four out of fourteen patients stated that six months after the surgery they continue to feel some pain and referred to its intensity, type and duration, but the majority of them is free of pain. Some of the participants commended about side effects of pain and they characteristically stated that they are better psychologically but the losses that happened due to the bad mood and temper because of pain before surgery are still present. 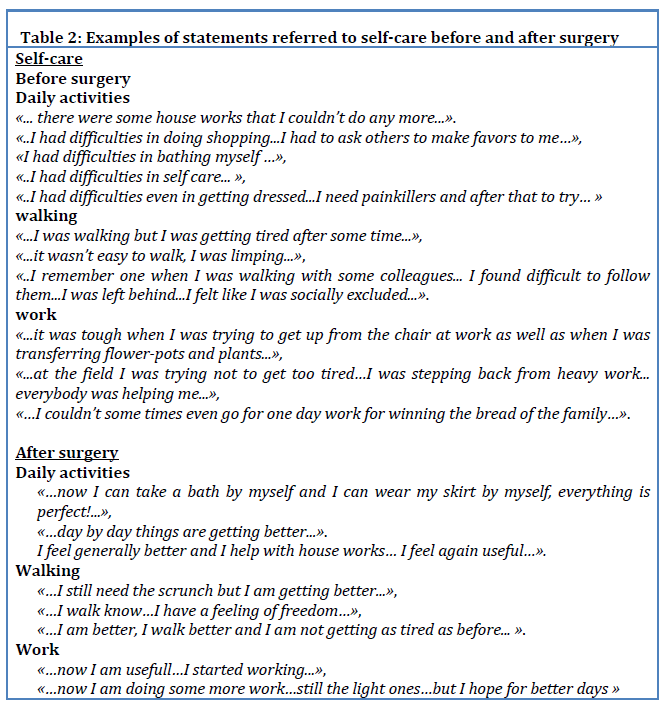 Regarding self‐care subjects discribed their capabilities before and after surgery and examples of their words are included in table 2. Regarding the difficulty in performing self‐care activities subjects reported a reduced ability to perform them daily and they were mostly stressing the difficulty in walking. Seven out of the fourteen patients of our sample stated that they needed pain killers in order to fulfill their daily needs of self‐care. Out of the fourteen patients, nine were working and three of them were facing problems at work. Seven out of the nine participants stated that they were able to self‐care for themselves and four out of nine who work stated their confidence for greater improvement in working better in the future. 3. Patients’ feelings about their state of health and their difficulties in selfcare. Almost all the participants (13/14) reported that they had bad mood and that they were stressed, while disappointment about their capabilities, fear and stress for facing un uncertain future it was reported from the majority (8/14) the subjects. Some others, (3/14) they felt guilty that they didn’t follow the doctor’s suggestions regarding medication and physical therapy, while two of the participants they felt shame because they were understanding that they were a burden for their loved ones, or because they were not able for full participation in social life. Statements of the subjects are included in table 3. Thirteen out of the fourteenparticipants stated they were satisfied with the improvement in their physical health and in their psychological condition, as well as with their renewed attitude towards life. Examples of their statements are included in table 3. According to the patients’ statements families provided support to almost all of the participants in their every day life. Four of the participants reported that due to their weakness were offered a substantial financial help from their family. Furthermore, family reported to be the main source of emotional support for the vast majority of the participants, while some of the participants mentioned the support provided to them by their doctor and from the church. Family provided also support for deciding to have the surgical procedure, while one mentioned his doctor’s contribution in decision making, while another acknowledged the support provided by a woman who was paid for helping him at home. In table 4 characteristic statements of the subjects are included. Twelve patients stated that they do not need any more so much immediate support from other people for their self‐care, while others, mostly the elderly, stated that they still need psychological and financial support. Statements are included in table 4. The present study, because of its qualitative character, contributes to the better understanding of problems that patients with arthritis face and of those problems’ effects on their quality of life. Even though the results of this study cannot be generalized, none the less they allow us to “see” the comparisons that the patients make between their quality of life before and after the surgical procedure, and they help us get a better understanding of how total knee arthroplasty can change the quality of life of those people and can allow them to see into the future with optimism. It is obvious both from the results of this study and from other study findings [19,23,26,29] that the nature of the symptoms of knee arthritis and the chronicity of the disease burdens the patients and their families physically and emotionally. The analysis of the interviews showed that pain, weakness in full or partial response to basic daily needs, such as dressing or personal hygiene, and difficulty in walking were the most important problems. For those who were working, difficulty in walking was the most important problem since it inhibited almost every effort to work. Some patients commented on the indirect social exclusion that they felt. In some cases the participants focused on the financial difficulties that they were facing because of frequent absences from work. Emotional problems, stress and difficulties in handling feelings were common problems for almost all the participants who stated that they were psychologically influenced and worried both about the development of their problem and about their weakness to pursuit their favorite activities. 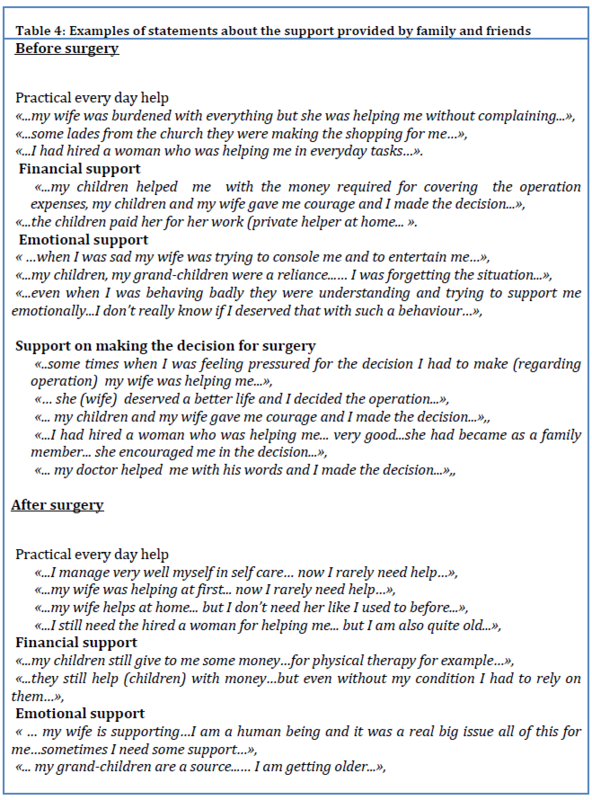 Family contributed significantly in their support and the role of the spouse was very important for the patients support in their daily life and for taking the decision to undergo the surgical procedure. In the cases when there was no partner, the children or the siblings or doctor or the privately paid helper of the patient were taking the role of carer and supporter. The patients stated that the improvement in their functionality after surgery and the improvement in their quality of life were immediate and satisfactory. Relief from pain and the feeling that they are not anymore a burden was of great importance for the participants. Those findings agree with previews studies [19,21,25,29]. The present study’s results show that surgical operation of total knee replacement consist solutions for patients leading, in most of the cases, to full recovery on a physical and on a psychosocial level. Nevertheless, more research is needed on the field in order to understand the patients’ situation at the immediate postoperative period, as well as for assessing the real family contribution in helping those patients. Gill TM, Feinstein AR. A critical appraisal of the quality of quality‐of‐lifemeasurements. JAMA 1994, 272:619–629. Rogdaki E, Arsenos P: Minimization of the fuel consumption through the optimum material selection of a car frame production company, First International Conference on Environmental Economics and Investment Assessment, Proceedings, Volume 1, 13‐15 September 2006, Mykonos, Greece, pp. 189‐196. Sprangers MA, Aaronson NK. The role of health care providers and significant others in evaluating the quality of life of patients with chronic disease: a review. J Clin Epidemiol 1992; 45: 743‐760. Addington‐Hall J, Kalra L. Who should measure quality of life? BMJ 2001; 322: 1417‐20. Molzahn AE, Northcott HC. The social bases of discrepancies in health/illness perceptions. J Adv Nurs 1989; 14:132‐140. Husted SA, Johnson JG. Oncology clients’ affective states and their nurses’ expectations of clients’ affective states. Cancer Nurs 1985; 8:159‐165. Camp LD, O’Sullivan PS. Comparison of me dical, surgical and oncology patients’ descriptions of pain and nurse s’ documentation of pain assessments. J Adv Nurs 1987; 12:593‐598. Thompson MM, Sayers RD, Reid A, Underwood MJ, Bell PRF. Quality of life follo wing infragenicular bypass and lower limb amputation. Eur J Vasc Endo vasc Surg 19 95; 9:310‐ 313. Johnson BF, Singh S, Evans L, Drury R, Datta D, Beard JD. A prospective study of the effect of limb‐ threatening ischaemia and its surgical treatment on the quality o f life. Eur J Vasc Endovasc Surg 1997; 13:306‐314. Roos E. & Toksvig‐Larsen S. Knee injury osteoarthritis outcome score (KOOS)‐validation and comparison to the WOMAC in tot al knee replacement. Health and Qu ality of Life Outcomes 2003; 1:17. World Health Organization The World Health Organizat ion Quality of Life (WHOQOL)- Bref.WHO 2004. Tanner J.M., Growth at Adolescence. Oxford, Blackwell Scientific Publishers, 2nd ed., 1962:18. Tanner J.M., Growth of bone, muscle and fat during childhood and adolescence, in Lodge, M.E., ed., Growth and Development of Mammals, Butterworths, London, 1968:26. Tanner J.M., Whitehouse R.H. and Takaishi M., Standards from birth to maturity for height, weight, height velocity, weight velocity: British children, 1965. Part I and II. Arch. Dis. Child., 41: 454‐613, 1966. Batakis Ch., Daskalakis G., Karpathios S.E., “Adolescents and sexual activity: A prospective study”, in IV European congress on pediatric and adolescent gynecology, Rhodes‐Greece, September 29th ‐ October 2nd, 1988, p.417‐418. Tsougeni‐Stavreka A., Papachristou N., Comparison of attitude, trends and knowledge on sexuality of High School students in the city and the villages of the Prefecture of Kastoria, Primary Health Care 1999, 11(4): 214‐217,. Papathanassiou Z., Gotzamanis K., Vinakos G., Research of Sexual Attitude of the youth, Hellenic Sexology Institute, Press Conference, Athens, 18 January 1996, p.2. Logsdon MC, Birkimer JC, Ratterman A, Cahill K, Cajill N., Social support in pregnant and parenting adolescents: research, critique and recommendations, J Child Adolesc Psychiatr Nurs 2002, 15(2):75‐ 83. Υoder BA., Young MK., Neonatal outcomes of teenage pregnancy in a military population. Obstes Gynecol 1997, 90:500. Christodoulou C.N., Alexakis C., Giannakopoulou C., Diakakis J., Koliopoulos C., “Abortion in adolescence”, in IV European congress on pediatric and adolescent gynecology, Rhodes‐Greece, September 29th ‐ October 2nd1988, 375‐377. Dorts H., The years of adolescence – the formation of the groups, Glaros Editions, 1993: 22. Karachalios P., Kanellopoulos N., Palaiologos A., Papageorgiou I., Gryparis S., “Pregnancy and health consequences in adolescents”, in Proceeding IV European congress on pediatric and adolescent gynecology, Rhodes‐Greece, September 29th ‐ October 2nd1988, 394‐399. Paskiewics LS., Pregnant adolescents and their mothers. A shared experience of teen mothering, MCN Am J Matern Child Nurs 2001, 26(1):33‐8. Whitehead E., Teenage pregnancy: on the road to social death, Int J Nurs Stud 2001, 38(4):437‐46. Koumantakes E., “Abortion, contraception and adolescence”, Announcement at the 1st Seminar on Sexual Education and Health, Athens 5‐7 November 1987, pp.113‐117. De Jonge A., Support for teenage mothers: a qualitative study into the views of women about the support they received as teenage mothers. J Adv Nurs 2001, 36(1):49‐57. Christopher SE, Bauman KE, Vaness‐Meehan K., Perceived stress, social support, and affectionate behaviors of adolescent mothers with infants in neonatal intensive care. J. Pediatr Health Care 2000, 14(6): 288‐96. Mostriou A., Nikolopoulou E., Gounaropoulou M., AIDS prevention with Health Education in Schools, New Health, Hellenic Society for Health Promotion, 1988, 21‐11.